One half of teenage girls and one-third of teen boys use unhealthy weight control behaviors such as skipping meals, fasting, smoking cigarettes, vomiting or using laxatives. 40-60% of six to twelve year olds are concerned about their weight. 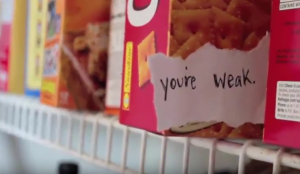 My friend, Molly Watkins, created this short video “Through the Eyes of the Hungry” to highlight the lies and misconstrued ideas people have about weight. Please watch. What lies are you believing about beauty ? What is causing you fear about your weight? Do you believe these lies? 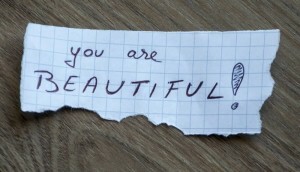 Let us redefine beauty and encourage true worth. That is when real change will occur and people will stop harming themselves by t reating food as an enemy. True beauty is a caring heart, a smile shared, a hand extended, eyes that really see and ears that really listen. Let’s encourage that kind of beauty and learn to love ourselves the way we are. Part of loving yourself is filling your mind with positive statements about yourself. What you think in your mind will eventually become what you believe. Here are 25 positive statements you can pick from to repeat to yourself daily. 2. The world has a need for me. 3. I am unique. I can and I will do things to promote healing in my life. 4. I can handle this one step at a time. 5. The sun is shining; I am ready to take on another day. 6. My problem has a solution; I will work on a plan. 7. I am a survivor. 8. I refuse to give up because I haven’t tried all possible ways. 9. I will inhale confidence and exhale doubt. 10. I may be one in 7 billion but I am also one in 7 billion! 12. I believe I can change the world (or at least my corner of it). 14. Today, I will celebrate me. 16. I can find peace through prayer and meditation. 18. My confidence is beautiful. 19. I am imperfect but I’m perfectly me. 20. My smile can make someone feel better. 21. I choose to focus on what I can control. 22. Everything will work out in the end. 23. If it hasn’t worked out yet, it’s not the end. 24. I am happy with who I am. 25. Every day, in every way, I am becoming better and better.